ATMs offer you a reliable source of constant income. ATM Money Machine Inc. has developed a program that will enable you to get into the ATM business! Now you can reap the rewards from this outstanding business and we will help you with our proven techniques every step of the way. Every time you place an ATM machine you earn 100% of the transaction income for as long as the ATM machine is there! You can get into this business with very little cost and virtually no limit to the money you can make. Since ATM Money Machine’s ATM program has no hidden fees it is the business opportunity of a lifetime! There is no other ATM banking company that offers a no cost ATM program like ours. The ATM business is extremely profitable, and anyone can get into it, but most people have no idea! We have a step by step guide that explains the business and helps you every step of the way. Download the starter kit here to be walked through the entire process from start to finish! We also have sample contracts we can provide to our customers for the business owners to sign, as well as flyers to hand out to help grow your business! Contact us today to get started! Results related to your ATM may vary. Most people getting into the business want to know how much capitol they need to get into the ATM business. The ATM business is a very inexpensive business to get into. With an ATM business, you need no employees or a storefront. It requires a very low start up cost. Your investment into the ATM machine can be paid back in less than six months. You can manage your ATM business from home at your own schedule. You may only have to go to the location of the ATM machine once or twice a month depending on usage and amount of money stocked in the machine! You can also own an ATM business, while still working a part-time or full-time job since it requires so little time! 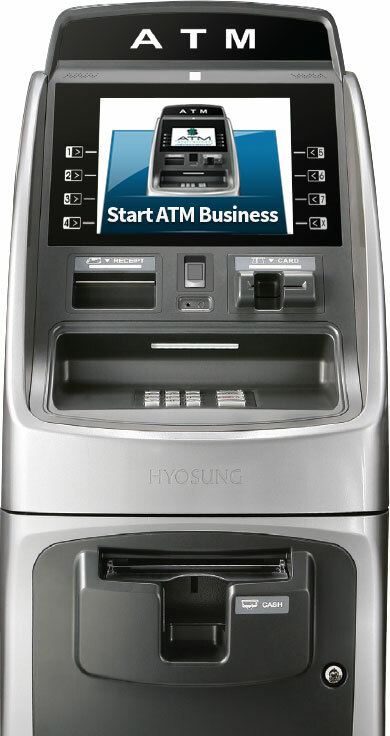 You can get started into the ATM business for a very low cost. For as little as $2,099, you can purchase your first machine. You can stock the machine with as little as $500 or as much as $16,000+. Most customers stock their ATM machines with between $1,000-3,000. Therefore, you can get started with your first ATM machine for about $3,000. THERE ARE NO FRANCHISE FEES! You can pay off your ATM machine in the first six months or less, and everything from then on is a profit. ATM machines can last as long as 7-8 years or more, allowing you to be collecting money off of the ATM for many years. At ATM Money Machine we suggest you start with one or two machines, and build your ATM business up from there. You can gain a good understanding of the ATM machines and how they work, and then expand your business! Your first and most important step when getting into the ATM business is finding your location. Many people ask, do I have to own the business to place an ATM machine there? You do not! All you have to do is approach the business owner and see if they’re interested in having an ATM machine inside their business. Some reasons why a business owner would like a machine in their business is to lower their credit card costs, see more cash being spent, as well as to attract customers into their business just by having an ATM machine on premises. They have no responsibly of the ATM, yet get to reap all of the benefits! With credit card costs being so high, most business owners would rather see cash being spent. By having an ATM machine on premises, they will see cash being spent rather than having to take plastic! Therefore, they will see lower credit card costs and more cash spending! Many people ask what type of location will do well? There’s no specific location that will do well, rather the foot traffic is the main aspect to look at when trying to find a location. Anywhere from 4-6% of people walking through the door each day will use the machine. Therefore, as an average, if there are 100 people walking through the door, that machine will get 5 uses a day. You want to find a business that averages 200+ people a day. If the business sees 200 people a day, you’re looking at about 10 uses a day (300 a month) and if you’re charging the national average surcharge amount of $2.66, that’s a $798 profit each month! When placing an ATM machine in a business, some owners of the business would like a part of the surcharge. Being that the business owner sees all the benefits of having the machine there (more cash being spent, lower credit card costs, increased cash spending, etc) you have some room to negotiate to ensure you get the lowest possible rate. Some business owners simply want the machine there, and don’t want any of the commission. At ATMMM we suggest you pay based on a sliding scale. For example, for 0-200 transactions, pay them .25 cents. For 201-400 transactions, pay them .45 cents. For 401-700 transactions .50 cents. For 701 and above, pay .75 cents. This way, you’re protected regardless of how many transactions the ATM does! All ATM machines must be connected to the processing server. There are a few options as far as connection goes. Most businesses have internet in their business, and the machines can connect to this internet saving you any monthly fees. You would need an Ethernet jack by where the machine is going to be placed, or an open port on the modem with the cable line run to where the machine is going to be placed. Another option is a phone line. You would have to have the jack within 3 feet of where the machine is going to be placed. If a phone line or internet connection isn’t available, you can purchase a wireless router that creates it’s own wireless internet. All three options work the same. The phone line or internet line must be run PRIOR to the installation being set up, as the ATM technicians do not run lines. Once you have your location, and are ready to purchase your machine, there is some paperwork that has to be filled out. We also need a copy of a void check for the account you want the money to be recycled into. The paperwork will give you your own unique merchant ID, which allows you into the processing server. Once all your paperwork is filled out, you’re now in the processing network and can own as many machines as you’d like! Once you have your location, just give us a call and we can get you over all the required paperwork with instructions on how to complete it! Once you have completed steps 1-5, you’re ready to purchase your first ATM machine. You have to have your location prior to purchasing the machine. The lease option does not apply when you are getting into the ATM business. There are numerous different machine options, with varying aesthetics. We suggest you pick the machine that will best fit in with the business. We offer both stand alone ATM machines, as well as thru the wall ATM machines. Thru the wall machines are significantly more expensive, and are only suggested when it’s a very high volume location for walking traffic. 99% of the time, a standalone machine is what is suggested. We carry all the major manufacturers of machines, and can help suggest a good fit for a certain business. We do suggest that you stay with the same manufacturer for all your locations if possible, as it will make things easier for you! You can look through all the different ATM options on our “Buy ATM” page, or you can give us a call for a direct e-mail of all the brochures and pricing on the machines. The ATM machine will be shipped directly to the location of where the machine will be operational. A service technician will program, install, and train you on how to work your new ATM machine. We will provide you with this technician. The pricing ranges from $349-450 depending on the location of the business. The technician will program the ATM machine with all your banking information, as well as what you’d like displayed on the screen and receipt. The technician will also set your surcharge amount you selected. The installation and training should take 1-3 hours. The technician will show you how to operate your machine, as well as how to stock it with cash and receipt paper. Many people want to know how much to stock the machine with, and there is no correct answer to this question. Most machines hold between $16,000-$20,000 in 20s. However, most people don’t put nearly this much into the machine. We usually suggest a minimum of $1,000 in the machine. The more money you put in the machine, the less you have to go back to refill the machine. How the cash works is as it’s taken out of the machine, it’s automatically wired right back into the bank account you set up with our company. If it’s taken out before 3pm, it will post tomorrow morning, after 3pm it’s the following day. So that cash is always recycling through. Therefore, the smaller amount you stock the machine with, the more often you’ll have to take that cash out back out of your bank account and restock the machine. We do set you up with a website where you can monitor the machine, so you can track how much cash is left in the machine which will ensure that you never let you machine run out of cash. Once the machine is up and running, next comes the easy part! You can sit back and relax, and monitor your machine from home. When the machine gets low, simply re-stock it with the same cash. You can also monitor your surcharge from this website, so you know how much you are making off of your machine! Your next step would be keeping your eye out for a new location, so you can build your business up even more!